Railroad cars blocking a busy Lufkin highway have been cleared and traffic on Loop 287 began flowing normally Tuesday morning. However, the majority of the 58-64 rail cars remain grounded after 80 mph winds knocked the cars from a railroad bridge down to the highway underneath. The rail cars were unmanned and no injuries were reported, but some residents believe the parked rail cars were an accident waiting to happen. Jeremy McQueen was just yards away in this apartment complex when the trains toppled. "As soon as I got out here I saw that the wind was blowing extremely hard," McQueen said. "It was crazy and obviously it turned the train over. It could've killed somebody or injured or broke down some buildings. If it had happened on a Monday or Tuesday...it could have been a lot worse than it was." Retired railroad engineer Monty Collins of Alto said he drives on Loop 287 almost weekly. "I've always guessed it would someday happen, it always does somewhere. I'm uneasy; I always was," Collins said. "I dare say that there's a better way." Collins is hoping the Angelina and Neches River Railroad Company (A&NR) will stop storing train cars on the bridge. "That's where they store cars because it's cheap, it's unused, it's available," Collins said. "You'd have to make other provisions to store those cars. But I would still say stay off the bridge." David Perkins, president of A&NR, said the bridge is like a parking lot for their empty, unused rail cars. The units remain there stationary, almost consistently and Perkins said he knows of many railroad companies that do the same thing. Perkins also stated the railroad and surrounding area is their private property. He said his company will look at whether they should discontinue storage of the cars on the bridge. 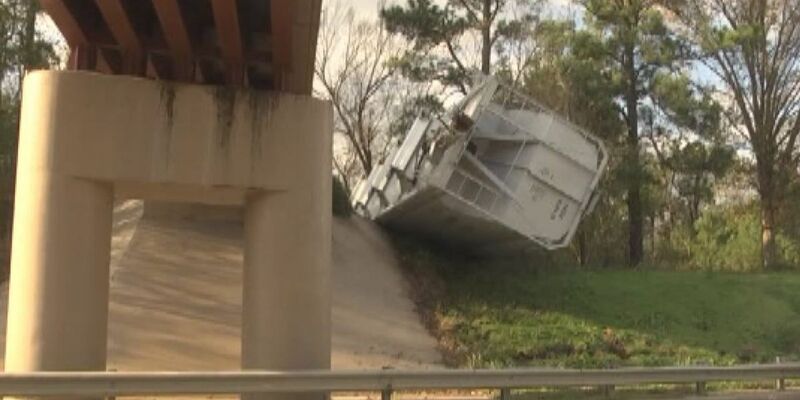 Texas Department of Transportation (TxDOT) representative in Lufkin, Rhonda Oaks, said TxDOT cannot regulate what happens on the bridge, only on the highway where automobiles travel. Federal Railroad Administration regulations do not prohibit railroad operators from parking a train or storing rail cars on a bridge. Locally, the City of Lufkin ordinances also don't address parked trains on bridges. Collins, who has a 25-year railroad background, recommends "uncoupling" or separating the units at the bridge. "I would make a cut on dry ground, back it up from the bridge so that there's good footing, and then pull it on across where there's good footing," Collins said. According to a Volpe Department of Transportation study, 'Analysis of Weather Events on U.S. Railroads' wind is "one of the most disruptive weather event for rail, comprising approximately 20% of incidents and derailments in 1995-2005. Collins plans to approach the railroad company first about changing their guidelines for parked rail cars on bridges, but said if that doesn't work, he'll ask city council to consider changing the Lufkin city ordinances.